Two Bayesian Mixer meet-ups in a row. Can it get any better? Our third ‘regular’ meeting took place at Cass Business School on 24 June. Big thanks to Pietro and Andreas, who supported us from Cass. 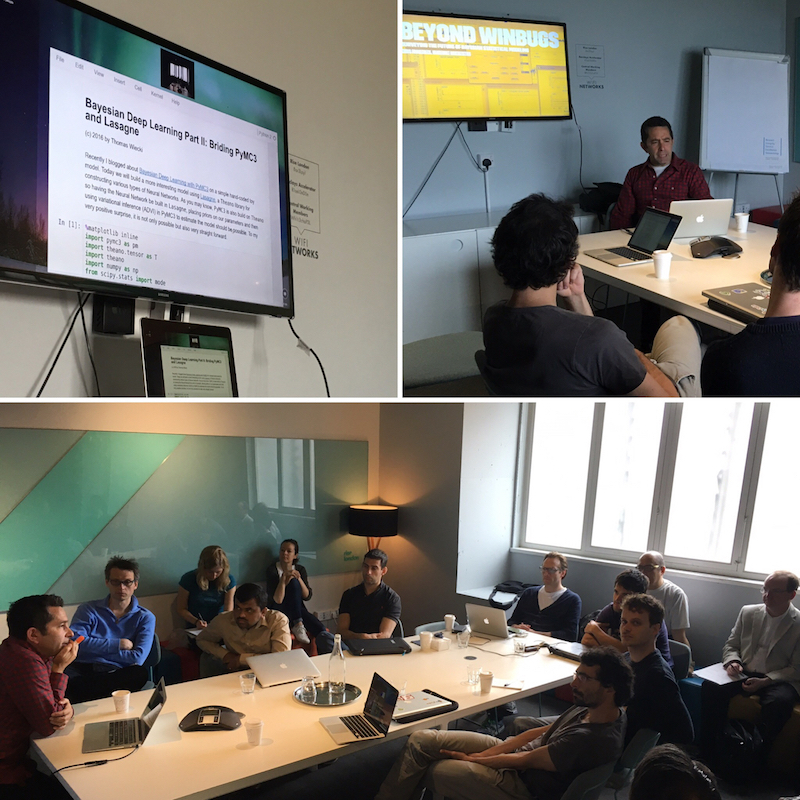 The next day, Jon Sedar of Applied AI, managed to arrange a special summer PyMC3 event. First up was Luis Usier, who talked about cross validation. Luis is a former student of Andrew Gelman, so, of course, his talk touched on Stan and the ‘loo’ (leave one out) package in R. Luis started with a simple artificial example that aimed to predict the probability of goalkeepers to save a shot on target. Adding a hierarchical structure to the model and treating the variance as a random variable, resulted in a pathological posterior distribution, which makes sampling next to impossible. Instead, fitting different models, with different fixed parameters, allows the user then to compare the models via cross-validation using the ‘loo’ function. Clever! I need to learn more about this. Luis’ slides are available here and the underlying source code on GitHub. We were lucky to have Robert Cowell talking to us, in what was his final week at Cass. Robert has been very much at the forefront of Bayesian development over the last 30 years. He is one of the co-authors of Probabilistic Networks and Expert Systems. Robert gave an insightful talk on probabilistic models for analysing mixed DNA traces. For illustration purpose, he used a crime case, where a man was killed in a pub, and where blood traces were used to support identifying the murder - turning statistics into a thriller. Following those two stimulating talks, we had a few networking drinks at the Artillery Arms. But not too many, as the next day continued with another Bayesian event. We had a rare opportunity to gather together a few of the core contributors of the PyMC3 package for a talks & hack session. PyMC3 is a leading framework for probabilistic programming entirely based in Python with a ‘theano’ backend, with support for the NUTS sampler, Variational Inference and lots of useful functionality - an alternative to Stan. We had two core contributors with us: Chris Fonnesbeck (usually in Nashville, USA) and Thomas Wiecki (online from Düsseldorf, Germany), plus other package contributors. 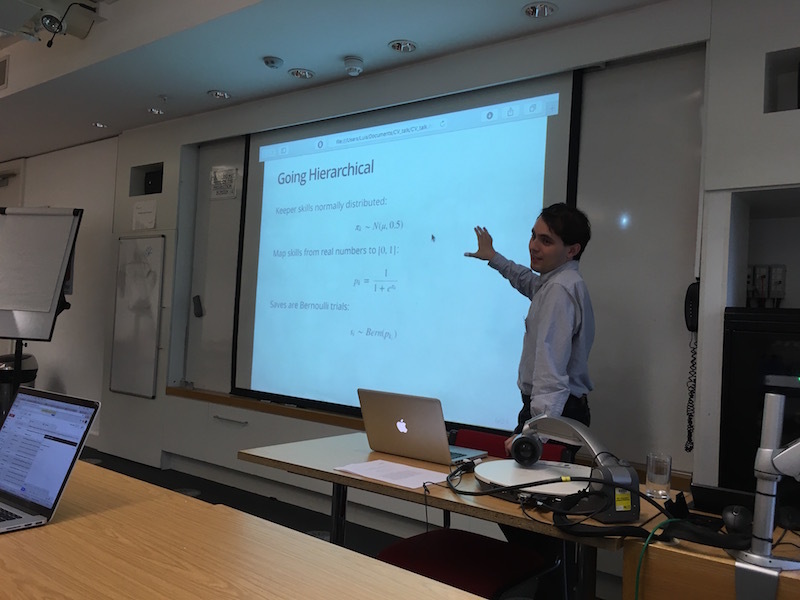 On Saturday morning Chris gave an overview of PyMC3, followed by a detailed talk of Thomas on Bayesian Deep Learning. The afternoon was spent hacking together away on different problems. I was new to PyMC3, so I went through the tutorial on Probabilistic Programming using PyMC3, which Chris had given at a workshop in Oslo. Many thanks to all who helped to make these events such a success and especially to Chris, Thomas, Luis, Robert, Andreas, Pietro and Jon. If you have ideas for a future event, then please get in touch and visit our Meetup page.